county, Nebraska. Mr. Ford rented a farm eight miles north of that town, and soon afterward his wife and Mrs. Cocklin joined their husbands. A sister of Mrs. Ford's came with her, but remained only a short time. Mr. Ford now resides on a leased farm on section thirty-one, township seventeen, range fourteen, where he operates four hundred acres of well improved land that is well adapted to grain and stock raising. He has a fine herd of cattle and has met with fair success, keeping on hand usually about twenty-five horses and three times as many head of cattle. Mr. Ford's father and mother are both deceased. His brothers, William McMillan and Richard C., live in Iowa, as does his sister, Sarah E. (Mrs. William Smith), and his sisters Laura May, (Mrs. James Harlan Everly) of North Loup, and his sister Eliza Ann, (Mrs. Everett O. Cool), of Alliance, are the only members of the family beside himself who came to Nebraska to live. Mrs. Ford's sister, Estella Maud, (Mrs. Charles Edward Trump), lives at Bradshaw, Nebraska. She is a daughter of John and Mary (McLaughlin) Smith, who had four children; the mother died February 9, 1890, while the father is still living at Marshalltown, Iowa. The only child living besides Mrs. Ford is Mrs. Trump, above mentioned; a half-brother, John J. Duby, lives in Boulder, Colorado, he is a son of John Duby, who was killed during the war. To Mr. Ford and wife three children were born: Beulah Maude, Achsa May and Loyal Jared. For the past twenty-five years Mr. and Mrs. Ford have helped in the advancement of the educational and other movements for the good of their portion of the state. He is a director of school district number forty-seven, and in former years held the office of treasurer of Yale township. He is recognized as a man of strict integrity and square dealing, and is held in high respect by all who know him. In politics Mr. Ford is a democrat; he is a member of the Ancient Order of United Workmen, being a charter member of the North Loup lodge organized in 1893. Located very pleasantly in section thirty-five, township twenty-one, range four, is to be found the genial gentleman whose name heads this personal history. Mr. Reed is one of the well known and highly esteemed old-timers of the region, and has had considerable to do with the development and growth of Madison county, having come to the county about 1887. He has endured the usual hardships and privations experienced by those hardy spirits 'who braved the terrors of the frontier in the hopes of carving out for themselves a name and fortune from the soil. A. G. Reed is a native of Smoland, Sweden, born December 28, 1866. He was the youngest child in a family of six coming to bless the union of John and Christene Reed, who were farmers in that country. He grew up there to the age of fourteen years, receiving a scanty education while assisting his parents on the home place. May 1, 1880, Mr. Reed left his birthplace, going to Gottenburg and there taking passage on the White Star Line steamship bound for New York, and landed safely in that city after a voyage of eight days. He first went to Illinois, securing work in a factory at Sterling, Illinois, and remained there for seven years, then came on west, arriving in Madison county, March 11, 1887. Here he shortly afterward bought the old Olson Sholes homestead, which was a rather rough and unimproved tract, and required a great deal of hard work to put in shape. He went to work faithfully and soon had it in good running order, and in spite of the fact that he had some hard luck occasioned by crop failures, storms, etc., he rapidly forged to the front as a successful farmer and stockman, and at the present time is classed among the well-to-do men of his section. Mr. Reed was united in marriage May 2, 1894, to Miss Anna Wedergreen who was born and raised in Sweden. Mrs. Reed died July 11, 1894. John R. Longfellow, one of Custer county's early settlers, who has passed through many periods of Nebraska history. He has large land interests in the state and is a successful farmer and stockman. He was born in Dewitt county, Illinois, eldest of the eight children of R. M. and Melinda (Bright) Longfellow, the date of his birth being July 11, 1855. He has two brothers in the state of Washington, and his two sisters, Mrs. Mary Thomas and Mrs. Ella Bryan, live in Custer county. The father and mother were born in Ohio and Pennsylvania, respectively, and located on a homestead in Custer county in 1882. Both parents died in Custer county, the father in 1892 and the mother July 26, 1902.
county, he May 3,1911, and she in 1893. Mrs. Longfellow was the first born of fourteen children, nine of whom survive: William, of Blaine county, Nebraska; Edmond, of Logan county; John J., of Idaho; Mrs. Lizzie Dagan and Mrs. Irene Hanna, of Custer county; Mrs. Rosetta Hanna, of Blaine county; Mrs. Augusta Harget, of Milford, Nebraska; Mrs. Anna Brown, of Dewey, Wisconsin; and Mrs. Longfellow. Mr. and Mrs. Longfellow have seven children, namely: Charles P., at home; Daisy, wife of George Kindness, of Custer county, has one child; Lilly, Alice, Johnnie R., Florence and Esther, at home. Mr. Longfellow is widely and favorably known in Custer county as an enterprising and public-spirited citizen, interested in the progress and welfare of the region. He is an able and ambitious farmer and has made his own way in life, attaining a very fair degree of success in Nebraska. He has a well improved farm in Custer county and also land interests in the state of Wisconsin. He was instrumental in the organization of school district number seventy-four, and for several years served on the board of same. Mrs. Longfellow also served several years as director of the board. Both are well known in many circles and have many friends. Among the sturdy sons of Old Albion who have found their way to Nebraska and by thrift and energy secured a competency for thmeselves [sic], may be mentioned Robert Marshall Sears. Mr. Sears was born in the village of Frittenden, Kent county, England, August 31, 1840. His parents, Henry and Millicent (Marshall) Sears, spent their entire lives in England, the father's death occurring in 1848 at the age of forty-nine, while the mother's life was extended to the year 1879, when she was seventy-eight years of age. When a youth, Mr. Sears was apprenticed to a butcher but was not indentured, so when, at seventeen years of age, he desired to come to America to join five of his brothers who had preceded him here, this preceptor gave consent. Embarking at London in an old sailing vessel, the "Palestine," April 11, 1857, he landed in New York the twelfth of May and went direct to Syracuse, where his brothers were established. Here he made his home, except during his service in the army, until coming west in the spring of 1869. His mother had instilled in him a hatred for slavishness and slavery in any form, so when the war of the rebellion broke out, Mr. Sears was one of the first to answer the call of his adopted country. Enlisting April 15, 1861, the Monday after the attack on Fort Sumpter, Company E was assembled May 6, the day the captain received his commission, and was mustered into the Twenty-fourth New York Volunteer Infantry the seventeenth of the month. Mr. Sears participated in both battles of Bull Run, Chancellorsville, Antietam, Sugar Loaf Mountain, Fredericksburg, the Wilderness campaign, campaign at Petersburg, the engagements around Cold Harbor, the battle on the Weldon railroad, the Shenandoah Valley expedition, including Winchester, Fisher's Hill, and Cedar Creek, in all thirty-four engagements, great and small, including that of Saylor Creek, the last fight along the Potomac on April 6, 1865. His service was in the third battalion of what was known as the Iron Brigade, first division and first army corps. He was wounded in the second battle of Bull Run and convalesced in the hospital at Philadelphia. The artillery fire in which he was engaged was at and around Cattelett Station, a few days before the second battle of Bull Run. Though little mention is made of this in general history, it was one of the deadliest of the war. Serving out his first enlistment, Mr. Sears veteranized December 29, 1863, and served until the close of the war in the First New York Independent Veteran Artillery. On peace being declared, the army disbanded and Mr. Sears returned to Syracuse and his young wife, whom he had married during a furlough granted him prior to his re-enlistment. For a year or two he engaged in the meat business and later was employed in a silver factory making spoons, forks, and tableware, until his migration to the west in 1869. At Paxton, Illinois, he rented farm land until the fall of 1872, when he removed to Sherburne county, Minnesota, near Elk river, where he farmed for eight years on a homestead tract he entered there. It was during his residence here that Mr. Sears endured the severest winter in his experience. From November 9, 1880, to the latter part of May following, but one train passed through on the railroad in that country. Drifts in some places where trains were shoveled out, were twenty feet high. Between the cracks of an outer door, snow sometimes drifted into the house to a depth of three feet. Christmas morning in 1879 they awoke with the fires all out and the thermometer registering seventy-two degrees below zero, the coldest temperature they have known. Leaving Sherburne county, Mr. Sears and family resided for a year in Jackson county and a like period in Martin county, and then in the spring of 1882, he was employed for the summer in the construction of the Burlington, Cedar Rapids & Northern railroad in Iowa. In September of that year, he located in Pierce county, Nebraska, and has made this state his home ever since. best teams in the community. In the fall of 1903, he purchased some twenty acres in the College addition to Plainview, and built a commodious dwelling, which he has occupied since the following spring, having leased his farm. He has planted trees on both the farm and the town place. Mr. Sears was married in Syracuse, New York in December, 1863, to Miss Laura Squier, a native of Joliet, Illinois. Her parents, George and Lydia J. (Hopkins) Squier, died in the east. Of their eight children, all are living. They are: Charles, residing in Council Bluffs; Hattie, wife of Frank Finney, of Plainview; Ella, married C. W. Davidson, and with her daughter, Edith, makes her home with her parents; Ina is the wife of Bert Southwick, of Norfolk; George, employed as conductor of the Northwestern railway, lives in Norfolk; Oliver lives in Chicago, Illinois, engaged as a steel expert; Minnie, married Albert Meeker, who lives near Phillips, South Dakota; and Leonard is a contractor and builder at Naper, Nebraska. In January, 1909, Mr. Sears attended a reunion of his family at the house of Henry Sears, a brother, over eighty years old, at Fabius, New York, whom he bad not seen in forty-three years. His sister, who is seventy-one years of age, he had not met in fifty-two years. They are all that is left of a family of nineteen children, fourteen of whom lived to be grown. Mr. Sears has endured the usual privations of the frontier, weathered the blizzard of 1888, and has fought prairie fires so severe that his eyebrows have been scorched off, part of them never growing in again. He has suffered years with rheumatism, especially during the early years of sod house life, and excepting a touch of that malady he is now as rugged as a much younger mail, and bids fair to attain ail extreme old age. In politics, Mr. Sears affiliates with the republican party. Prominent among the progressive ranchmen and citizens of Merrick county, Nebraska, is the gentleman whose name heads this personal history. He has long been a resident of this county, and has done his share in the development of this section. He resides on section thirty, township fifteen, range five, being one of the few who still live on their old original homestead. Lucius C. Lawson was born in Crawford county, Pennsylvania, December 9, 1850, and was the eldest of eight in the family of Harvey and Maria (Stewart) Lawson, who had three sons and five daughters. Mr. and Mrs. Lawson were of Quaker parentage. The Lawson family moved to Toledo, Tama county, Iowa, in 1865, where on November 12, 1873, the father died. Mr. Lawson, the subject of this sketch, practically became the head of the family at his father's death and went out for himself at the early age of fifteen or sixteen years. Mr. Lawson came to Merrick county, Nebraska, in October, 1873, and homesteaded land in section thirty, township fifteen, range five, and this homestead ranch and farm is still the residence of Mr. Lawson, who, as stated before, is one of the few that still remain on the old original homestead. He now has three hundred and eighty-two acres in his farm, or rather stock ranch, where he deals in stock, making a specialty of short-horn cattle, Berkshire swine, and standard bred horses. Mr. Lawson has always been an active figure in the upbuilding of this portion of Nebraska, being foremost in all modern improvements for the rural districts, and for educational advancement. In fact, he is a booster for county and state prosperity. Mr. Lawson has traveled extensively, gaining ideas of progress, which enables him to assist materially in the development of his community. Mr. Lawson was married to Miss Marian J. Bander in Omaha, Nebraska, October, 1873, Miss Bander being a native of New York state. Six children were born of this union, four of whom are living: Harvey J., married, has two children and lives in Blaine county, Nebraska; Clarence E., a widower, has one child, and also lives in Blaine county; William W., married and residing in Blaine county; Harrison M., married, has one child, also a resident of Blaine county. All of the boys are on Kincaid homesteads. Mr. Lawson since coming to Merrick county has made the homestead farm his continuous home, although he has resided temporarily in other states and other Nebraska localities, at one time living in Lincoln to school the children. Mother Lawson died in Cedar Rapids, Iowa, February 19, 1908. Mr. Lawson and brothers William and Charles J. are residents of Nebraska, and the remainder of the family are in different states. Mr. Lawson in past years was connected with the Farmers' Elevator and also other business propositions in his county. He has a pleasant home and possesses a fine library, of which he is justly proud. Mr. Lawson is president of the Nebraska Farmers' Congress and a member of the executive committee of the National Farmers' Congress, having been elected to both positions without any solicitation on his part. He has recently been appointed by the governor as a member of the commission of Nebraska, intended for educational work, for giving the farmer a broader and higher education. Mr. Lawson has for years advocated the draining and ditching of the Platte valley, and largely at his suggestion this is being done. He is president of the Merrick County Agricultural Society and a member of the State Board of Agriculture. Among the native born Nebraskans whose entire lives have been spent within the borders of the state, we would be remiss should we fail to mention George Wilkison Chambers, cashier of the Niobrara Valley Bank. He is the namesake of one of his father's most intimate friends, George Wilkison, with whom the father kept up a weekly correspondence to the time of his death. George Chambers is a son of Benjamin F. and Sarah A. (Hull) Chambers, both natives of Westmoreland county, Pennsylvania. They came to Nebraska in 1856, and settled in Dakota City, where the father plied his trade of blacksmith, an occupation that gave him a giant's strength in his massive, sinewy frame. He served as sheriff of Dakota county prior to his removal to Niobrara in 1877, when he was appointed register of the land office, a position he filled for eight years; while James Stott and others served as receivers. He was elected county judge and held his place on the bench for six years before retiring from active life. He died at Niobrara, Nebraska, March 11, 1906, at the age of seventy-five years. The mother lives in Niobrara, having attained full four score years of life. Of their children, five are living: Belle, wife of John W. Wood, of Hawarden, Iowa; Edwin H., in business at Columbus, Nebraska; George W., of whom we write in this article; Alice B., wife of John W. Turner, of Springfield, South Dakota; and Sarah A., who was married to William C. Mason of Chicago. George Chambers was born in Dakota City, Nebraska, November 6, 1867, and lived there the first twelve years of his life, arriving in Niobrara, May 29, 1879. The family continued to reside in Dakota City some two years after the, elder Chambers' appointment to the land office. The first man the boy met on arriving in Knox county was Mr. Frank Nelson, with whom he was later to become associated in business; and the first man he met in town was Judge Solomon Draper, one of Nebraska's grandest pioneers. The boy had begun his schooling in Dakota City and continued in Niobrara, but did not finish the course, being eager to get to work. He began work in the bank even before his school days were over, sweeping out mornings, running errands and making himself generally useful. On completing his schooling, Mr. Chambers became bookkeeper in the bank, later assistant cashier, and since 1895 has served as cashier of the institution of which his old friend, Frank Nelson, is the head. He is also vice president of the Farmers' State Bank of Verdel, and of the Bank of Lynch, in Boyd county. His whole business life has been spent in banking, which he understands thoroughly in all its departments, including lands and insurance. Mr. Chambers was married in Niobrara, December 20,1889, to Miss May Thompson, a native of Wisconsin, and daughter of Robert and Margaret (Casey) Thompson. Three children have been born to them: Helen, Stewart and Margaret. Mr. Chambers is a staunch republican, and attained his majority on election day, 1888, when he voted for Harrison and the entire republican ticket. He has joined a number of the branches of the Masonic order, being enrolled in the blue lodge at Niobrara, and in the chapter and commandery of the Knights Templar at Bloomfield. Mr. Chambers has vivid recollections of the great flood of March, 1881, when their dwelling, which stood on the highest ground in the old town, had water on the lower floor to the depth of about two inches. With his mother and the younger children, he was cared for the first night at Judge Draper's, and spent a week or ten days following on the Jackson ranch near Bazile Mills, which to a boy was one continuous picnic, he regretting that, with the receding waters, it became necessary to go home. He remembers well the moving of the town across the prairie to its present site, and had a boy's share of playing around the big hotel and other buildings on wheels. Their wood-house was above the flood crest, and in consequence contained the only supply of dry fuel in town. Neighbors borrowing a small supply had it skidded over to them on the glare ice that formed on the pools left after the water receded. At the time of the blizzard of January 12, 1888, Mr. Chambers was in the bank, but found no difficulty in making his way home, though many lost their bearings in going but a few rods in the storm. He was instrumental in playing a joke on the druggist next door: After clearing the snow away from in front of the bank, he and a friend made a bargain to clear it away from in front of the drug store for "a good cigar apiece," and had twenty helpers before the last of it was shoveled off. The victim of the joke paid each his hire, but found it an expensive piece of work. Mr. Chambers has always been fond of hunting, fishing and camping, and well remembers when it hunter could go out into the hills around Niobrara and get forty to fifty prairie chickens after four o'clock in the afternoon. He makes frequent trips to Lake Andes, South Dakota, during the open season, and brings in his share of game and fish. He is known among his friends as a jolly, good fellow, one who can play a good joke, and with an equally good grace take one when played upon himself. As a business man he has no superior, and in knowledge of land values and insurance ranks with the best. is held in the highest esteem. Mr. Galyean is a genuine "old-timer," and in the years he has resided in this region he has had much to do with the development of the county, both in a financial and social way. He is one of the foremost men of his locality, and in January, 1908, was appointed deputy sheriff of Boone county, which office he has filled creditably to himself and constituents. Mr. Galyean is a popular officer and is widely known in this section of Nebraska. Mr. Galyean was born in Delaware county, Iowa, November 6, 1869, and was fifth in the family of Jesse B. and Catherine Galyean, who had eight children, our subject being the only son. The Galyean family came into Boone county, Nebraska, in June, 1880, coming overland from Delaware county, Iowa, in regular pioneer style, with stock, etc. Jesse B. Galyean homesteaded eight miles northwest of Albion, and his son, George F. Galyean grew up on the homestead farm, purchasing same in later years, about 1896. Mr. Galyean grew up to his young manhood years on the farm, and went out for himself in about his twenty-first year, farming and stock raising. He made a success of his business, and some years later sold the farm and purchased four hundred acres of fine land in Custer county. Mr. Galyean was married to Miss Nannie Sutton, December 17, 1890, and to this union three children were born: Elva Viola, Marie Josephine, and George Lee, all of whom reside at home. Mrs. Galyean died in April, 1905. On November 26, 1908, Mr. Galyean was married to Prudence Longnecker, who was a native of Iowa, the family coming to Boone county in 1907. Mr. Galyean has practically grown up in Boone county, and is a successful self-made man. Connected with his farm experience he has been identified with the stock interests in this locality as a breeder, shipper and general salesman in horses. Mr. and Mrs. Galyean and family reside in Albion and have a pleasant town residence. A typical pioneer of western Nebraska is represented by the gentleman above named. He has lived many years in this section of the country and has been a part of the growth and development of this region, building up for himself a substantial home and fortune by his perseverence and thrift, and has come to be one of the foremost citizens of Antelope county. Mr. Gardner was born in Cayuga county, New York, April 13, 1835, and is a descendant of Wales, his grandfather having come from that country when he was a small boy. Our subject has served his country well during the agitating times of the civil war, when he enlisted in Company C, One Hundred and Thirty-eighth New York Volunteers, and later in the Ninth New York Heavy Artillery, and received his honorable discharge April 24, 1864. He participated in a number of battles, including Cold Harbor; Monockesy Station, Maryland; Cedar Creek. During the war our subject served under Captain Alden, General Lew Wallace and Major General George Wright. In the year 1864, Mr. Gardner went to the state of Michigan from whence he moved in 1875 to Saunders county, Nebraska, where he rented a farm, and in 1878 drove from there to his claim in Antelope county, where he experienced all the inconveniences and hardships relative to those days of the early pioneer. The market place was at Columbus, some sixty miles away. During the grasshopper raids our subject lost everything. During these early days Mr. Gardner at times worked for neighbors and was paid one bushel of wheat per day, which was worth thirty-five cents per bushel when hauled to Fremont. In 1876, Mr. Gardner came to Antelope county, near Tilden. There were but a few settlers here and they had a great many frights from the red skins, but never had any trouble with them worth mentioning, only one time when they were on the war path and set fire to buildings and murdered some people, but were captured at O'Niell by soldiers before they reached our subject's neighborhood. Antelope, deer and elk were plentiful in those days. Our subject built two sod houses in the early days. While in Saunders county when wood was required it had to be hauled by ox team from the Platte river, which journey consumed two days to get a small load of wood. At one time in 1879, Mr. Gardner was caught in a prairie fire and nearly lost his life. His wife only saved their hay and stable by the most strenuous efforts. Mr. Gardner was married July 5, 1858, to Miss Susan Hyde, and two children were born to them, named as follows: Corwin, who married Miss Jennie Sherman, they have four children; and Anna L., who married Charles Tatro, who have five children. In 1871 our subject's wife died. On December 10, 1872, our subject again married, Miss A. Stanton, to whom seven children were born, whose names follow: Addie, who married R. S. Gibson, who have eight children; Olive; Emma J., who married Paul Dewitt; Ada, who married Albert Irwin, and has four children: Stella, married to J. Jenkins, and has one child; Ray; and Susie, who is married to Frank Adamson. Thus ends the personal history of one of Nebraska's early pioneers who is reaching a good ripe age and whose years have been well spent in the advancement and industry of life. Alfred O'Brien, who is an early settler of Nebraska, is a prosperous and successful merchant of Mason City, where he is well established in his line of business. He is one of the substantial and highly respected citizens of the town, interested in everything affecting the progress and development of county and state, and is widely and favorably known. Mr. O'Brien was born at St. Ormonds, province of Quebec, February 11, 1855, the eldest of the seven children born to Thomas and Ann (Corcoran) O'Brien. the father was born in Ireland and at the age of two years was brought by his parents to America, growing to manhood in the state of Vermont. He served in the civil war as a private in Company I, Foster's Division, First New York engineer corp. He resides in Cheruhuser, Clinton county, New York. and is now (1911) eighty-seven years of age. His wife, a native of Portland, Maine, is of Irish parentage and is now seventy-seven years of age. But one of their children, Alfred, resides in Nebraska; one son lives in Concord, New Hampshire, and one in Boston, Massachusetts; two daughters in Montreal, Canada, and a son and daughter in New York. In early childhood Alfred O'Brien accompanied his parents to Clinton county, New York, where he grew to manhood on his father's farm, receiving his education in local schools. He started out in life on his own account when sixteen years of age, being employed by a railroad company. In 1874 he located in Nebraska and for the next eight years made his headquarters at Grand Island, Nebraska, being for this length of time in the employ of the Union Pacific company. He was united in marriage at Grand Island, November 23, 1881, with Ellen McAllister, who was born in Council Bluffs, Iowa, daughter of William and Ellen (McTwiggen) McAllister. In the spring of 1882 Mr. and Mrs. O'Brien came to Custer county and homesteaded one hundred and sixty acres of land on section thirty-five, township fifteen, range seventeen, where they lived some dozen years. He also took up a timber claim of one hundred and sixty acres. While living on his farm he served several years as a member of the school board of district number nine. In 1895 he sold part of his farming interests and came to Mason City, where he erected his present comfortable modern residence. He still owns a six hundred and forty acre, well equipped stock and grain farm. After coming to Mason City, Mr. O'Brien engaged in hardware and grocery business, in which he met with pleasing success. In 1905 he lost his building by fire and soon afterward erected a fine concrete business block. His business is well established and he enjoys the confidence and esteem of a large number of patrons. Three children were born to Mr. O'Brien and wife: Evelyn, wife of C. M. Anderson, lives in Broken Bow; George, deceased, aged nine years; and Frank L., lives at home, attending the public schools. Having spent so many years in Nebraska, Mr. O'Brien has passed through many periods of the history of the state and is well known in his community, where he has a large circle of friends. Mr. O'Brien has been a Mason ever since he reached his majority, member of one hundred and seventy Ancient Free and Accepted Masons, Duel chapter number eleven, of Grand Island, Nebraska; also a member of the Ancient Order of United Workmen. Walter M. Alvord, who resides on section eleven, township nineteen, range fourteen, Valley county, Nebraska, was born in Foxburg, Pennsylvania, February 8, 1880, and is second of three children in the family of Benjamin and Alice (Randall) Alvord, who had two sons and one daughter. Mr. Alvord was only a few months old at the time his father and family came to Valley county, Nebraska, and practically all his years have been spent here. Mr. Alvord, senior, had purchased land in Valley county in 1879, and Walter, as he grew up to young manhood years, had the management of the farm near Ord while his father attended to his duties as station agent of the Union Pacific railroad at North Loup. On September 16, 1901, Mr. Alvord was married to Miss Ruby Evelyn Bowen, at Ord, Nebraska. Mrs. Alvord is a native of Valley county. Her parents, James C. and Eva (Hall) Bowen, were natives of Illinois and Missouri, respectively. They moved from Wisconsin to Valley county, Nebraska, in 1879, settling on land twelve miles northwest of Ord. They moved to North Loup in 1890, and eight years later to Ord, where they resided until 1907, removing that year to Powers county, Colorado, and now reside on a farm twelve. miles from Le Mars. Of their four children, three are living: Ben F., who represents the Standard Oil Company at Ord; Ruby Evelyn - Mrs. Alvord of this sketch; and Ruth Esther. Mr. and Mrs. Alvord have one child, a daughter, Ruby Evelyn. Mr. Alvord moved to his own one hundred and sixty acre farm, located in section eleven, township nineteen, range fourteen, in 1906. He has a fine, modern nine-room dwelling, erected in 1910, heated by furnace and lighted by acetylene gas, and a well equipped farm, with ail necessary buildings. An engraving of the home and surroundings adorns another page of our work. swine. He has made a success of farming and stock raising, and is a young man who has a promising future. In politics he is a liberal republican, and is a member of the Odd Fellows and the Modern Woodmen. With Mrs. Alvord he has also joined the chapter of Royal Neighbors at Ord. 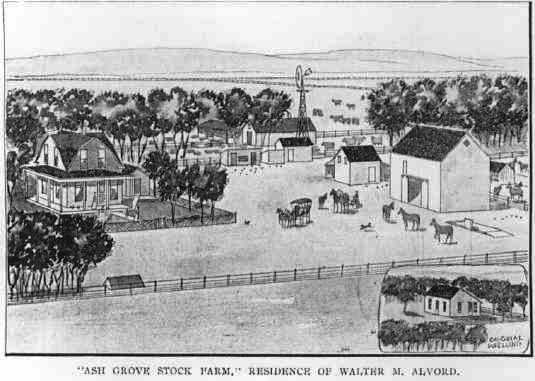 "Ash Grove Stock Farm." Residence of Walter M. Alvord. Benjamin H. Alvord, who resides in section eleven, township nineteen, range fourteen, Valley county, Nebraska, was born in Canaan, Columbia county, New York state, August 2, 1849, and was second of five children in the family of Henry Wells and Emily (Chapman) Alvord, who had two sons and three daughters. The Alvord family came from England to America in 1634, in the person of William Alvord, who emigrated from London to the colonies that year, he being a member of the Skinner Company settling in Salem, Massachusetts. The forefathers of this William Alvord date back in English history to 1060, supposedly of the family of Alford, then Alward, and later on to the name of Alvord, as it is known today. Helaz Alvord, the father of Henry Wells Alvord, was born in South Hadley, Massachusetts, March 28, 1791. and died at Bloody Brook, Massachusetts, December 12, 1829. Henry Wells Alvord was born in Massachusetts in 1821, and married Emily Chapman at New Lebanon, New York, in 1846. He moved to Pennsylvania in 1857, and there enlisted in the One Hundred and Forty-fifth Pennsylvania Regiment; among other battles and engagements he participated in that of Fredericksburg, and died in the service, in 1863. The Alvord family, known in English and American history, have had much to do with the revolutionary and civil war history of the United States, and are prominently known in army circles; the family have furnished soldiers and statesmen of renown and are known in state history; and in educational fields the Alvord family have taken no small part for many years past. At the close of the war the family scattered, Mrs. Henry Wells Alvord dying in Erie county, Pennsylvania, in 1872. Benjamin H. Alvord, the principal subject of this sketch, went out for himself in his early boyhood days and lived in Pennsylvania until coming to Valley county, Nebraska, in November of 1880, the season known throughout the northwest as "the winter of the deep snow." Mr. Alvord was united in marriage to Miss Alice Randall in May of 1873, in Erie county, Pennsylvania, and this union was blessed with three children, two sons and a daughter, namely: Walter, Howard and Belle, who is now Mrs. Ed Walker of North Loup. Mrs. Alvord died on the home farm, July 4, 1905, survived and deeply mourned by her husband and family. Mr. Alvord was employed on the Erie and Pittsburg railroad some six or seven years before coming west, and was in railroad employ from his eighteenth year until 1905; he was all employee of the Union Pacific railroad for twenty-four years, and station agent at North Loup, Valley county, for fifteen years. Mr. Alvord had purchased one hundred and sixty acres of land near Ord in 1879, and about 1905 he and his family moved on this farm, where they now reside, and have a fine new cement nine-room modern home, with bath room and numerous closets. A large silo is built into a corner of the barn, making a great convenience in feeding. A view of the home looking across the beautiful North Loup valley is presented on another page of our work. This is a fine dairy and stock farm and Mr. Alvord makes a specialty of fine bred Holstein and other pedigreed stock. Howard Chester Alvord, the second son, lives on the farm and works it jointly with his father. Mr. Alvord was again married, October 24, 1907, at Ord, the bride being Mrs. Lida Benson, daughter of Benjamin F. and Mary Ann (Hill) Kingsley, and a native of Pennsylvania. She first married George Benson, who died in the Keystone state. Mr. Alvord and brother, Elias, are the only surviving members of the family. Elias now lives in Washburn, Wisconsin, whither he moved in 1860, and where he is creditably filling the office of district attorney. In politics Mr. Alvord is republican; he is a member of the Presbyterian church and affiliates with the Modern Woodmen of America and the American Nobles, a fraternal order. 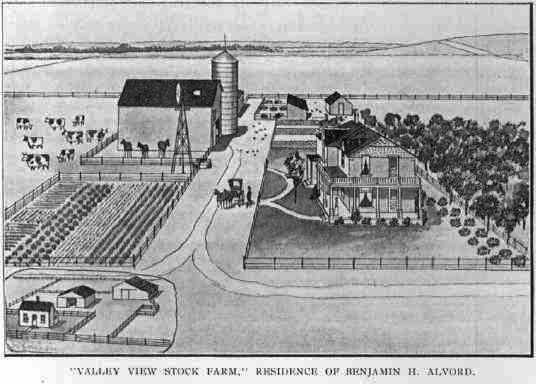 "Valley View Stock Farm," Residence of Benjamin A. Alvord. Bart Sazama, a resident of Pierce county, Nebraska, is one of the earliest settlers of that region. He has not only witnessed the wonderful transformation of this country from a wild and uncultivated state to one of prosperity and a region rich in agriculture, but he has assisted in its development and has acquired the highest esteem of those with whom he has associated for many years. He has a home of comfort, and is one of the worthy citizens of his township. Mr. Sazama was born in the village of Radonic, Bohemia, August 24, 1850, and is the son of Jacob and Katrine (Haus) Sazama; the former is still living in Bohemia at the advanced age of ninety years. Bart Sazama learned the blacksmiths' trade and followed that occupation in his native country and in Germany two years. In emigrating to America he sailed from Bremen in May, 1867, for New York, on the steamer "Metropolis." During the fourteen-day voyage, they passed through a very bad storm which lasted four days and three nights.